One of the best ways to upgrade your home’s security and curb appeal is to install a new great looking and sturdy front door with upgraded hardware. What Door Material To Choose For Door Replacement? Your door material choice will typically depend on what you’re replacing. A front door will need heavy-duty material like wood or even fiberglass while an interior door may simply have wood panels and hollow cores. Consider the reason for door replacement in the first place when selecting a material for your door. Are you seeking added protection from violence of any kind? Are you worried about natural calamities affecting your doors and windows? Ultimately, the door material choice will depend on your budget, preference, and circumstance. Talk to your locksmith about the best-suited options for you. What Kind Of Locking System Do You Need For Your Doors? Depending on the location of your door, you will need to consider the types of locks that work best for it. External doors like a front door need the maximum safety because it is the main entry point for burglars, so you may want to consider robust locking systems like deadbolts, keyless locks or smart locks. Conventional deadbolt locks may not sound fancy, but they do the job well. High-grade versions are available to ensure sufficient security around your home. Smart locks offer more features like voice and remote control, access logs and more, but they come at an extra cost. You can use levers and knobs if you want a secondary layer of security, in addition to your main locks as well on external doors. A sliding door or any other door type inside the house may not require such a heavy-duty lock, but you may want to choose something that allows for privacy from one room to the other. Knobs and levers are usually ideal choices for interior doors. Strike plates fitted to the door come with most locks. But standard short screws make them easier to kick in, which is why they need longer screws for better kick-in resistance. The choice of locks depends on your preferences and budget. 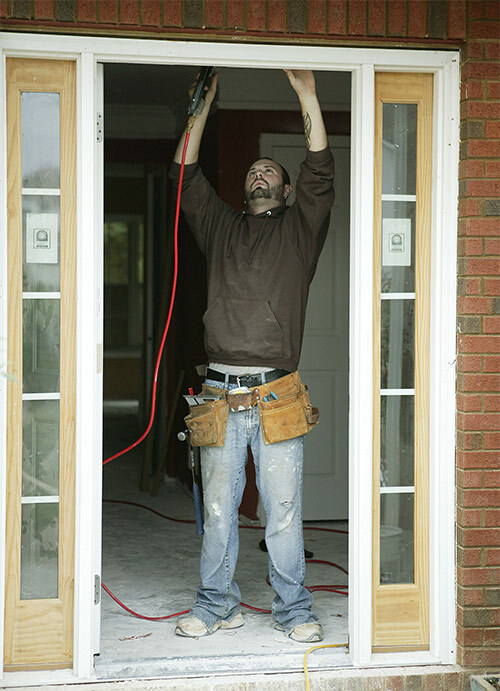 You should never take door replacement lightly, especially after a particular issue. Always choose an insured, certified and registered locksmith so you know you’re getting a professional. You’ll also want a locksmith that prices honestly and offers guarantees for their services. That’s why you need Black Hawk. We have a local lock store catering to Pittsford and Rochester in New York. We also offer mobile locksmith services for any emergency situations.